RacingJunk News > Uncategorized > ULMA Race Results – Marrant Keeps Rolling in Early Season ULMA Action! Photo courtesy of Lisa Burlington. 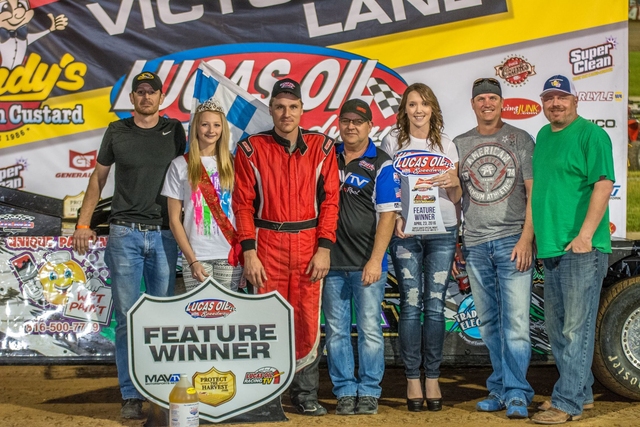 Aaron Marrant in a recent visit to Lucas Oil Speedway victory lane! (Photo is from ULMA Facebook). 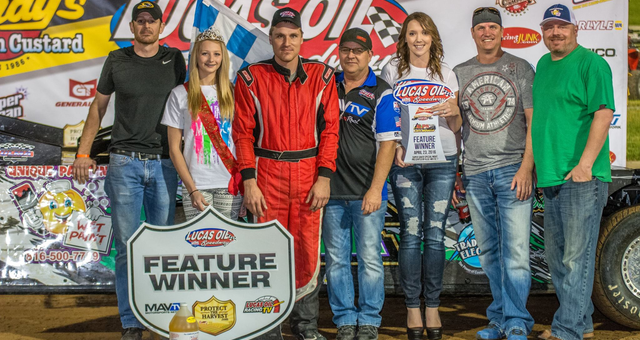 Aaron Marrant raced to his second-consecutive main event win at Lucas Oil Speedway last Saturday, continuing his early-season headline streak for Lucas Cattle Company ULMA. Marrant went into the weekend with hopes of taking a weekend sweep, but wet conditions halted the action at Lakeside Speedway on Friday. A field of 24 drivers took their place at Lucas Oil Speedway on Saturday evening where three heat races sorted out the main event starting lineup. Marrant held off a forward-moving Tommy Cordray and took heat one. David Melloway took heat race two over Larry Ferris while Bobby Penney took the checkered in heat three over Justin Russell. In the main event, Marrant and Cordray shared the front row, but it didn’t take Marrant long to assert himself and end up out front, chasing his second-consecutive win after dominating all 20 laps. Cordray finished a strong second, his best run of the year, while David Melloway finished third. An unfortunate pileup on lap six slowed the pace and led to an early event retirement for Russell as his car was too damaged to continue. Ferris advanced to fourth with 2015 ULMA Champion Jon Melloway finishing fifth. Jon Binning moved from his starting position of 13th to 6th and earned the hard-charger of the race. Ethan Young, Penney, Todd McCoin, and Chris Cox completed the top ten. ULMA weekly championship racing will take a week off at Lucas Oil Speedway this Saturday as the track hosts an open-wheel special event. ULMA action will return the following Saturday, may 14th. For more information and details, visit www.lucasoilspeedway.com.